Mthwakazi Republic Party (MRP) has said it is not going into an alliance with Thokozani Khupe’s MDC faction. 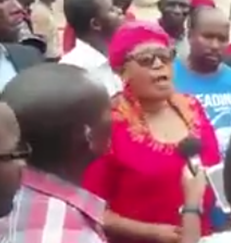 This comes after a Khupe rally held at Amphitheatre here over the weekend, where national organising secretary Abednico Bhebhe introduced members of Mthwakazi, together with the Joice Mujuru-led PRC and Ansa led by Moses Mzila Ndlovu. The parties in question were said to have attended the rally in solidarity with Khupe’s cause of splitting from the Nelson Chamisa-led MDC. MRP said there was no alliance with Khupe. “We woke up . . . to the social media buzz on the participation of MRP at Khuphe’s rally,” the party’s secretary-general Ackim Mhlanga said. “Although we are conveniently positioned to defend our own from Mthwakazi, we have never formerly engaged Khupe or taken a decision to meddle ourselves in shameful MDC issues,” he said. The Mqondisi Moyo-led party has gained friends and enemies over their radical stance on issues to do with the Gukurahundi atrocities and ethnicity. Mhlanga said they had no interest whatsoever to be dragged into the main opposition party’s internal squabbles.